Much significance is often given to the last words of someone, especially his last words uttered on his deathbed. Have you noticed that the final words of a person's life seem to command a little extra respect no matter how much they talked in life? When you’re dying, there’s no time for wasted words. When you know the clock is against you and you want to utilise what time is left to impact those you’re saying goodbye to, you speak the most important things you have to say. You say what is most urgent and you cut out the unnecessary gloss. Much have been written about the last words of the Lord as He hung dying on the cross. But little attention have been paid to the last words of His Mother, which interestingly is found in today’s gospel, at the beginning of Jesus’ public ministry. Why would Jesus addressed His mother as “woman”? We would return to this question shortly. But first let us look at the “hour” of Christ. Christ’s “hour” is the time at which He is betrayed, arrested, and killed: the moment of His greatest agony and greatest glory. That’s what He is referring to each and every time that He mentions “His hour,” and it’s what He’s warning her about. To say that His hour has not yet come is to indicate that Jesus follows a different schedule, not one set by men or re-shaped by contingencies. Jesus never acts completely alone, and never the for the sake of pleasing others. The Father is always the starting point of his actions, and this is what unites him to Mary, because she wished to make her request in this same unity of will with the Father. So, what appears to be a rebuke to the undiscerning eye may actually be an invitation – an invitation to submit obediently to the will of God. Our Lady responds in obedience to the Son’s total obedience. She immediately tell the servers, “Do whatever he tells you.” She doesn't tell Jesus “They have a problem, fix it.” She does not insist or demand. She doesn’t chart out a course of action for Jesus, much less specify the manner in which Jesus must resolve the problem. She leaves everything to the Lord’s judgment. This is how she teaches us to pray: not by seeking to assert before God our own will and our own desires, however important they may be, but rather to bring them before him and to let him decide what he intends to do. Obedience to God’s will is a necessary condition for prayer. She tells the servants to do what she herself would willingly do, “Do whatever he tells you.” These words carry much weight and significance because they are the last recorded words of Mary in the gospels. Thereafter, she observes a “vow of silence” throughout the gospel narrative and doesn’t even break it at the foot of the cross. Her last words would be her defining moment. It would mark her entire life’s mission – obedience to the will of God. With these last words, she sets the ball rolling for the rest of the story of her Son, His performing the first sign that would reveal His mission and His glory. It is now that we return to the manner in which Jesus addresses his mother. Instead of a more courteous, “Mother”, she is greeted with the title, “Woman.” As much as this seems to be a callous way of addressing one’s own mother, the title really expresses Mary’s place in salvation history. It serves to point to the future and to the past. It points to the future, to the “hour” of crucifixion, when Jesus will say to her: “Woman behold your Son …” It anticipates the hour when he will make the woman, His Mother, the Mother of all his disciples. It points to the birth of the Church at the foot of the Cross. It is also points to that mysterious “woman,” who is at the centre of the great cosmic battle between the forces of heaven and those led by the monstrous dragon (Rev 12:1) in which the forces of heaven would prove victorious. 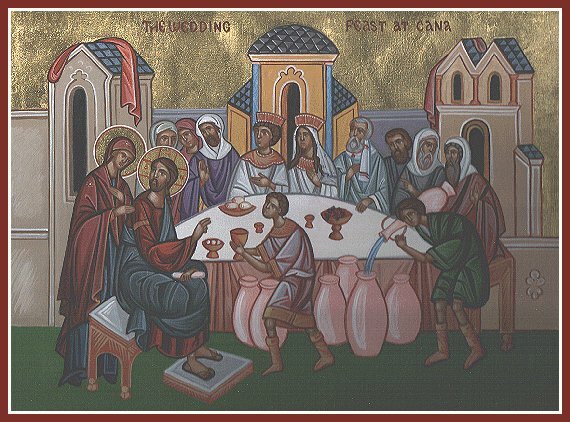 At the heart of the story of the Wedding Feast at Cana, therefore, is the story of obedience, the story of how this single virtue has restored the covenant broken by man’s disobedience. Disobedience leads to fruitlessness, to empty caskets and goblets. Obedience leads to fruitfulness, where the Lord would provide flowing wine that will never run out. Here in this story, we see the Son who sets aside his personal agenda and obediently submits to the will of the Father. We see the Woman, the Mother, who puts aside her need to be in charge of things and submits obediently to her son. It was through disobedience that man lost paradise, and it is now through obedience that a far better Paradise is restored. But the difficulty with obedience is that it is a matter assented to more often by the intellect than the will. After all, obedience is difficult; if it were easy, everyone would be doing it. Fortunately both Jesus and Mary are models for our obedience. Jesus reminds His disciples that “the world must learn that I love the Father and that I do exactly what my Father has commanded me” (John 14:31). Love is the key to obedience. In this light, “Do whatever he tells you” should not be seen as a legalistic call to tediously obey an all-powerful master. Rather, Mary’s words reflect the heart of a bride in love with her bridegroom. She obeys perfectly because she loves perfectly. Representing the faithful of Israel, Mary invites the servants, the disciples, and all of us to run after our Bridegroom’s desires, ardently seeking to fulfil whatever He wants of us. When there is no compulsion in love, obedience comes easily. Mary’s continuous faithfulness in the Gospel is critical for salvation history. Time and again, she willingly accepts the plan of God: she brings Christ into the world in the Incarnation, helps to lead Him into His public ministry at the Wedding of Cana; and follows Him to the Cross. Her first and her last words has always been an unconditional ‘Yes’ to the Lord. Mary's example makes it clear that obedience is not a virtue done out of fear — or drudgery. Because she trusted and loved God, she was able to obey Him resolutely. Through her, we learn the loving consequence of obedience since her obedience brought the Saviour of mankind into the world, it is obedience that will lead us to salvation!